I created this doodle last summer for a workshop, and thought it would be fun to turn it into a coloring page. Succulents have been on trend for some time now, and I don't see that ending anytime soon. They are just so fun, carefree, and timeless. In honor of day 50 of the #100dayproject, you can follow along here. In the meantime, enjoy this FREE printable coloring page that is perfect for both kids and adults (click here to download the entire page). Simply right click the image, and save it to your desktop! Please note that this page is for personal use only. For the past 24 days I've been participating in the #The100DayProject (you can follow along on Instagram). This year I decided I didn't want to put any parameters on my art making, but rather I just wanted to get back into the habit of creating something every day whether it be a quick sketch or doodle, a painting, a piece of digital art ... really, whatever my heart desired for the day. This piece stretched me far out of my comfort zone, which felt really good. My hope was to combine my my doodles with a loose painting style, which is not what I am familiar with at all. I made myself, even in the most uncomfortable times, push through and get it done! Something I've learned over the years is that we usually give up before we even give ourselves the opportunity to begin. We often feel defeated or overwhelmed by just starting the process, and find it even harder to commit and follow through. But somewhere between the flashes of doubt and bursts of excitement, the mess and the chaos of the creative process - is where the magic lies. And so I often, over and over again, have to retrain myself to show up and push through, even in the most challenging of times. Some days are hard, some days are easy, but at the end of it all, the satisfaction of committing and following through out weighs giving up, over and over again. Happy Spring, April, Easter, Birthday Month - Free Coloring Page for You! Happy Spring, April, Easter, and my birthday month! In honor of all of the celebratory events going on, I thought now would be the perfect time to release my spring coloring sheet to you all. I'd hoped to get it live back in March, but that didn't happen. Better late than never, right? 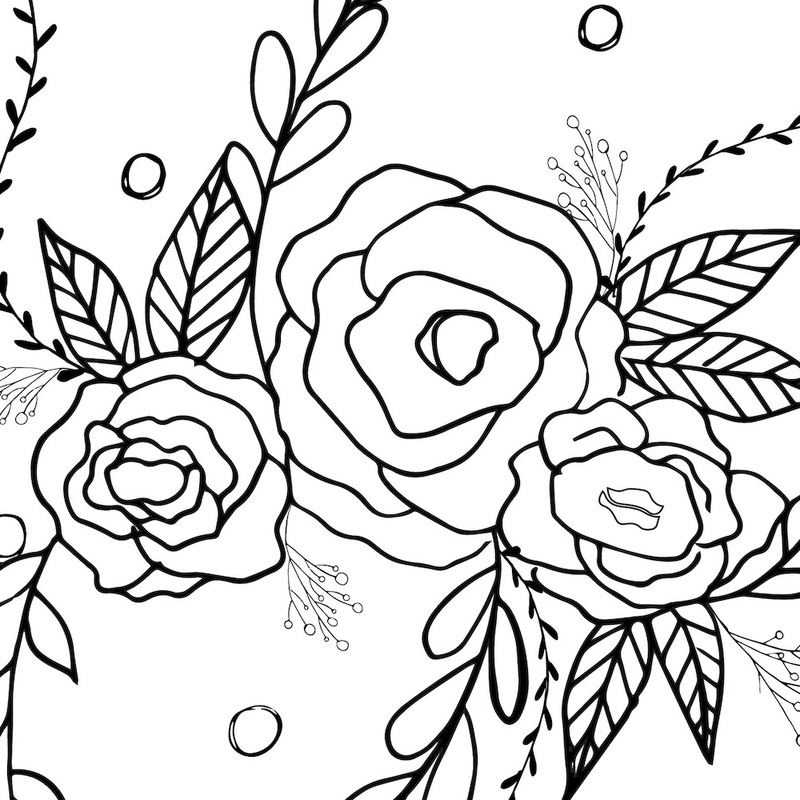 Enjoy this FREE printable coloring page that is perfect for both kids and adults (click here to download the entire page). Simply right click the image, and save it to your desktop! Happy Valentine's Day - Free Coloring Page for You! Well I hope you all are well. It's been a little quiet around here as a lot of transition occurred throughout 2016, but in all of it, one of the best things happened - I got a new job. I am working as Craft Designer for the Sizzix Art Department. Talk about a dream come true. The position has left me fulfilled, and full of creativity. I hope to start sharing some of my work with you here soon. In the meantime, I've been also challenging myself to be creative in my personal life from painting and drawing, to learning how to create repeat patterns. I was lucky enough to take Jessica Swift's Pattern Camp last year, but there is still so much to learn, so here I go. What started as a fun doodle (shown above) turned into this fun coloring page (shown below). Enjoy this FREE printable coloring page that is perfect for both kids and adults (click here to download). Simply right click the image, and save it to your desktop! There are moments in life where inspiration strikes, and all you can do is run with it. I love when that happens! I've never had a collection of work come together more seamlessly that this one, and deep down, that's exactly, I feel, that is should always be. Photography (one of my first forms of creative expression when I was younger) has always had my heart. Back then I used to dream of being a photographer when I grew up. Each week, I would drop a roll of film off at Target to get developed, and would have to wait a couple of days, if not longer, to get them back. Then came 1-hour photo, and now digital photography, which excitingly produces a lot of photos, but that I am really bad at printing them off. For this collection, I wanted to take something ordinary (a simple photo), and make it EXTRA-ordinary (into a piece of mixed-media art). Which is exactly what I did. When writing this post, I found some similarities about the past, and how it intertwined with my current art process. Just like I used to anxiously wait for my photos to be developed, now I excitedly wait for the paint and sealer to dry so that I can move forward with the next step, never really knowing what that is for sure, which feels much like getting that roll of 24 photos back. And can I tell you - there was something magical that happened when I would get to stopping point on each piece. I've learned over the years to really trust myself in knowing when a piece is complete. I hope you all love this collection as much as I do. It was truly a work of passion that was able to come to fruition. There are 9 pieces total, each that express a few of my favorite things - from #thebeautyofnature, to the metaphorical flower whose seeds are planted, and then with love, nurturing, and some water, they blossom from a bud to a full, flourishing flower. And then there is the my love for the ocean, which represents the ebbs and flow of life and creativity.